For the first time since the 20 game suspension of Nate Schmidt was handed down by the league, GM George McPhee met with the media to answer questions. He opened with a quick statement explaining that he is unable to talk about the specifics of the situation but, admittedly against his better judgment (“I probably shouldn’t even talk about this”), did to go into a bit of detail about how the Golden Knights handle supplements with their players. Prior to this press conference, based solely on the statement the team released following the NHL’s announcement, the Golden Knights seemed to be strongly backing Schmidt, however, McPhee’s statements today did a lot to separate that support from any accusations of wrongdoing by the team in this situation. This is a pretty stark contrast to Schmidt’s statement six days ago. McPhee was pressed further on the discrepancy. McPhee also offered a comment about what he told other players on the team, furthering his stance that the substance which caused Schmidt to test positive did not come from the Golden Knights. Due to the confidentiality agreement the GM was unable to say when he first learned about the failed test, when the test was taken, or the name of the substance. Per NHL rules, the team is not alerted when a player fails a test under the Performance Enhancing Substances Program. Instead, they alert the player directly. In this case, Schmidt called McPhee to let him know about the failed test. 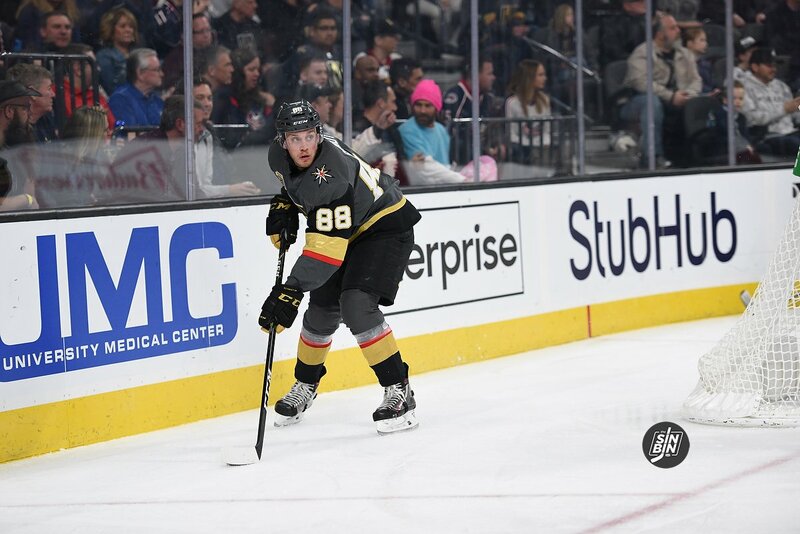 The timeline remains unclear due to the confidentiality agreement, however, we are aware that Schmidt was in contact with the Golden Knights throughout the process, McPhee did testify on behalf of Schmidt at the appeal, and McPhee did read Schmidt’s statement before it was released on the NHLPA website. Six days ago the team statement was “we strongly disagree with the suspension.” Today, “it didn’t come from us.” These aren’t opposite statements, so it should not be taken as the support for Schmidt has completely evaporated, but McPhee wasn’t bashful in making it clear that the substance was not provided by the team, which is a direct contradiction of Schmidt. Nonetheless, Schmidt will miss 20 games, and the team has to move on, but this story is far from over. Just shows how asinine these PES policies have gotten…grab a protein bar from the Convenient…have a protein drink from Starbucks…ingest ANYTHING that hasn’t been team-watchdogged…and athletes run the very real risk of unknowingly crossing The Line ! We’ve gone from no PES controls to black-marking players for testing positive at minuscule readings that most people can’t even comprehend. It makes me angry that a person as genuine as Nate has gotten caught up in this nonsense. I refuse to believe he knowingly did anything against the rules. Once a …Always a ! How many NHL players have ever been suspended again??? My concern is the complete lack of transparency in the process. Will never know the substance. Could it be something as crazy as being at a concert with someone deciding to smoke a bowl near him? Eating a poppy seed muffin? Eating a granola bar with hemp seeds? Drinking mineral water? At 7 nanograms per mL, which is multiples less than any drug test limit we would take, “environmental contamination” seems likely. Only feed the players water and bread. Oh wait, the yeast from the bread might cause a failed drug test. lol. Jamba Juice to be banned by WADA. And don’t forget about the stuff in store bought meat. Good only knows what they feed animals these days.